pc007 Potential counter for 2016. TP 1.2 coming soon! I m collecting now. secret1q why the TP is 1.2? MGO only offer u RM0.8 means the value only worth RM0.8. and the company is take off one off gain of disposal subsidiary is actually make losses last Qtr. Shall worth less than RM0.8. my guess. Contrarian101 possible injection post MGO perhaps? secret1q what injection possible to happen? look like the whole company will been taken by another party. Contrarian101 TP 1.2 coming soon? the EKIB Group over the three (3) financial years to FYE 31 December 2017. Are you holding this company share? Lohjunwei i am one of the shareholders too. Any good info about this company? secret1q most of the share in the hand on the big boss. the boss control the price. Lee Ah Chai This is a cornered counter but out of sudden volume increasing & price dropping! Margin account forced to reduce exposure? Lim Tek Wai Nice ! Start taking profit, thanks. 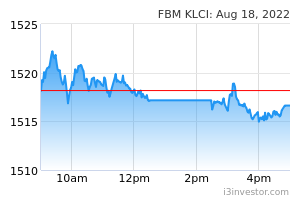 katak0320 dont hv dividend this year? commonsense 3Q18 result was higher compared to last years (eventhough revenue was lower) due to the completion of the 161 double storey shop office of Taman Sri Penawar project which bring in more margins. 4Q18 result should be lower compared to 4Q17 but mainly because the last year's result was the highest driven by the completion of the Pinnacle Tower. That being said MBworld should still be able to record a PAT of around RM10mil. Investors need to be ready to see a negative growth PAT in 4Q18.